The big dig is underway on D Avenue! Crews have excavated and re-rocked the roadway from 1st to 5th, and continue to progress west towards 10th. Two roadway segments on D Avenue are currently closed 24/7 to all through traffic – from 1st to 4th and 4th to 7th. In the next few days, the third segment – 7th to 10th – will close. Early next week, State to 1st will close for the excavation work. Despite the signage and persistent reminders, drivers, cyclists and pedestrians continue to cut-through the closed areas. LOPD has issued several citations to people for disobeying the signage and cutting around the road closure barricades. So that everyone stays safe, please obey the signage and allow extra time to get around the neighborhood. All drivers, pedestrians and cyclists – please use the open streets (1st, 4th, 7th or 10th) to cross D. The other cross streets are CLOSED to all through traffic between C and E Avenues. One resident recently described Emery’s operation of machinery and material as looking like a ballet. This construction certainly requires being methodical, efficient and active, plus, it does tell a story! Check out this video captured last Friday that shows the road excavation “ballet” taking place at the intersection of D and 4th. As shown in the video, during this phase of major road work, one crew is excavating the road/existing asphalt and underlying soil, then placing fabric and installing new structural base rock before moving up to the next segment. The asphalt and soil are loaded into separate trucks for reuse. The soil is used as clean, fill dirt and the asphalt is recycled at an asphalt plant. Mid-late next week, crews will begin preparing for the concrete flatwork to form the sidewalks/ concrete bands/ curbs. Truck traffic will be coming and going as crews excavate the entire roadway, form concrete and prepare the road for new pavement. The first base layer of asphalt is expected to be placed later in August. 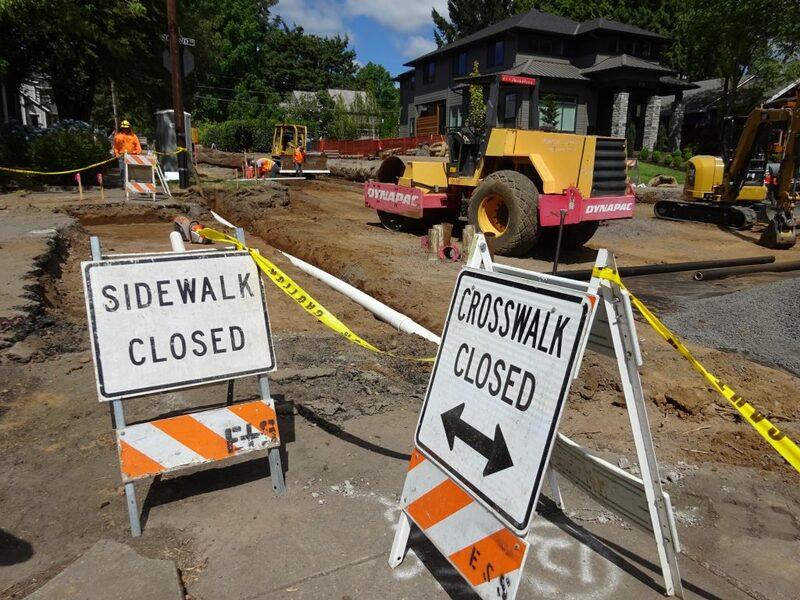 Crews will be working on a water connection late this Thursday night, July 26 at the intersection of D Avenue and 1st Street. Water service to residences and businesses along 1st Street, between B and D Avenue, and a portion of D Avenue, between State and 2nd Street will be shutoff on the late evening (11 p.m.) of Thursday, July 26 through the early morning (6 a.m.) of Friday, July 27. Door hangers have been issued to affected residents and businesses. To minimize impacts and inconveniences to both residents and businesses affected by the shutoff, this work will be conducted at night from 10 p.m. – 6 a.m. Crews will conduct as much preparatory work during normal work hours, but night work will result in noise from excavation equipment, truck traffic, movement of steel plates, running a hot saw, a generator and miscellaneous equipment. It’s amazing what you find when you dig up the entire roadway. 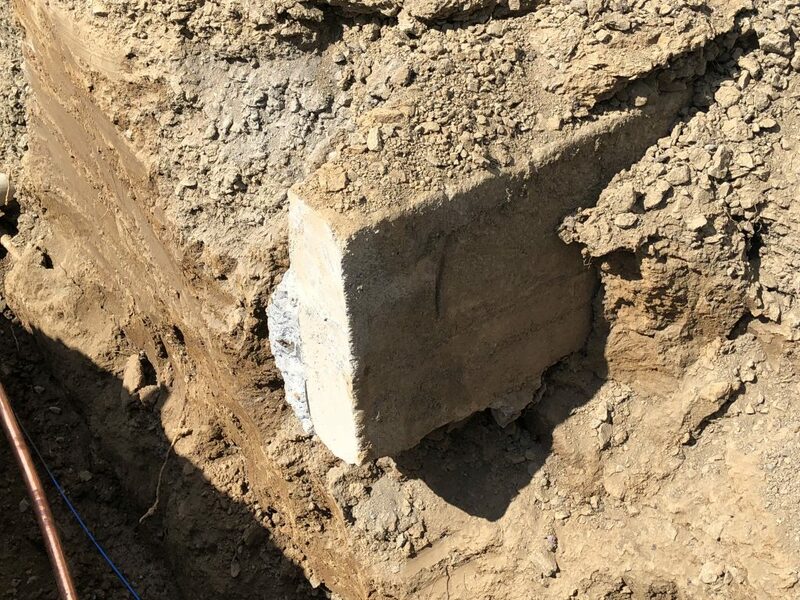 Who would have thought that during the road excavation, crews would have discovered an old concrete curb that was buried underneath part of the roadway along the entire length of D Avenue? They’ve also uncovered portions of an old sidewalk! Pictured below, City Engineer Erica Rooney, is amazed at the discovery. We’d like to give a shout out and a very special THANK YOU to the D Avenue neighbor who provided these tasty donuts last week to the crews! They really appreciated this kind gesture, thank you! At most times during the road closure, the contractor will maintain north/south access through the intersections of D Avenue at 1st, 4th, 7th and 10th Streets (see map). However, there will be short-term closures at these intersections while crews excavate the road. 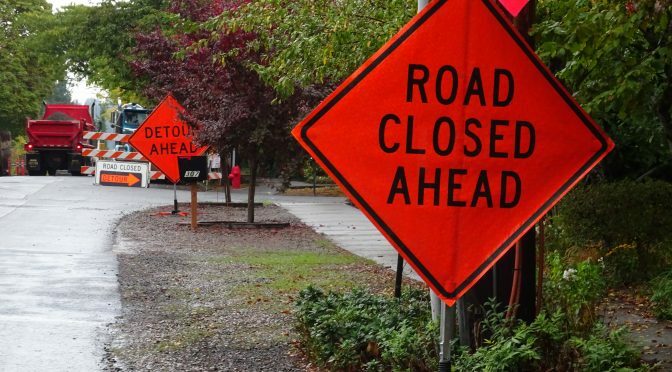 Access for residents living in the closed areas on D Avenue will be maintained at most times, but there will be periods where driveways are blocked. Crews will work with residents to provide reasonable and safe access to homes while work is occurring. Access to D Avenue from alleys is closed—alleys are barricaded at D Avenue. Neighbors need to access alleys from E or C Avenue. Parking – there is no on-street parking allowed in the closed areas along the D Avenue right-of-way. Neighbors and visitors should park on a side street. Please obey the signage – cars will be towed if they are parked illegally. Fire and emergency services will always have access to the neighborhood. Mail, deliveries, and garbage services will be maintained. We understand how inconvenient and disruptive construction is and we thank you for your patience while we make these important improvements! Construction schedules change frequently. We will strive to keep residents informed through these regular updates. You can also check out the City’s social media accounts for videos and photos. For more information contact the project team! The next phase of work is set to begin on the project! This will result in full (24-hour) road closures in multiple block segments along D Avenue for up to eight weeks. Drivers, pedestrians & cyclists – please be alert, avoid the closure zones, plan ahead for travel delays and use one of the four open cross streets to access the neighborhood (see below). Starting the week of July 16, crews will begin implementing the closures in segments. The first segment to close will be from 1st Street to 4th Street. The second segment will be from 4th to 7th, the third from 7th to 10th, and the final segment from State to 1st. 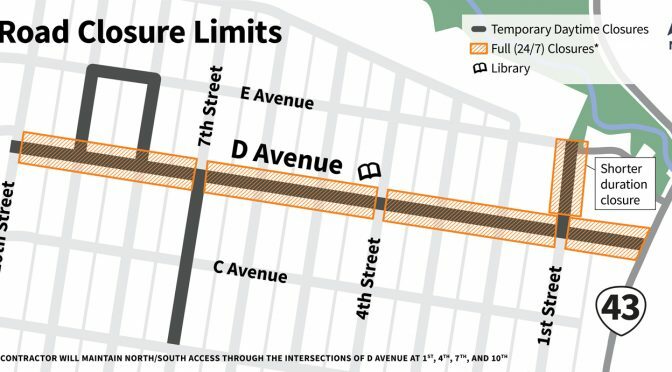 Within a week, the entire ten blocks is expected to be closed to all through traffic traveling east/west – including vehicles, pedestrians and bicyclists. North/south access points to cross D will be maintained at most times at 1st, 4th, 7th and 10th Streets. During the major road work, one crew will excavate the road/existing asphalt and underlying soil, install new structural base rock, and then move up to the next segment. Concrete crews would then arrive to form the sidewalks/valley gutters/curbs, and move onto the next segment. The next activity would include constructing the stormwater planters, then placing the first layer of paving (likely late August). The final activity would be planting the final landscaping, placing the final layer of paving and installing the lighting (in the fall). 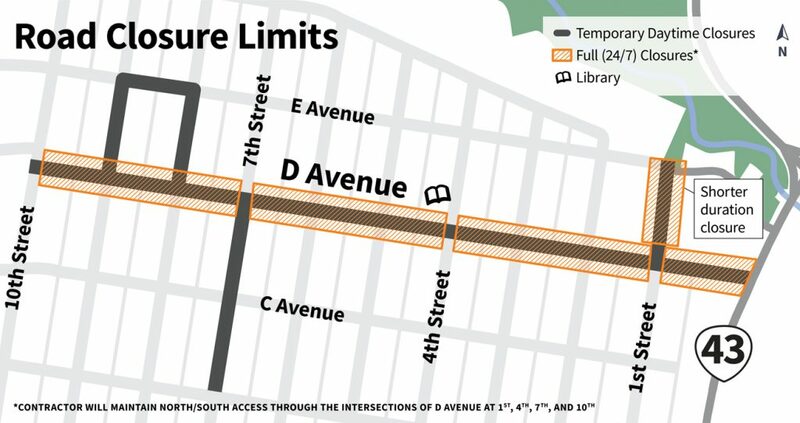 At most times during this closure, the contractor will maintain north/south access through the intersections of D Avenue at 1st, 4th, 7th and 10th Streets (see map). However, there will be short-term closures at these intersections while crews excavate the road. 1st Street, between D and E Avenues, will also be closed temporarily (up to three days) during the first base lift of paving. Disruption – road reconstruction work is loud, dusty, creates vibration and causes traffic delays. D Avenue will be completely dug-out, re-rocked, regraded, and then repaved. Truck traffic will be coming and going as crews excavate the entire roadway, form concrete and prepare the road for new pavement. Neighbors have already experienced an increase in dust with the utility work. Unfortunately, this will continue with the road reconstruction work, but crews will be running their water truck regularly to help manage this as best as possible. Parking – there will be no on-street parking allowed in the closed areas along the D Avenue right-of-way. Neighbors and visitors will need to park on a side street. Please obey the signage – cars will be towed if they are parked illegally. Preliminary scheduling shows water service to residences and businesses along 1st Street, between B and D Avenue, and a portion of D Avenue, between State and 2nd Street will be shutoff on the late evening (11 p.m.) of Thursday, July 26 through the early morning (6 a.m.) of Friday, July 27. 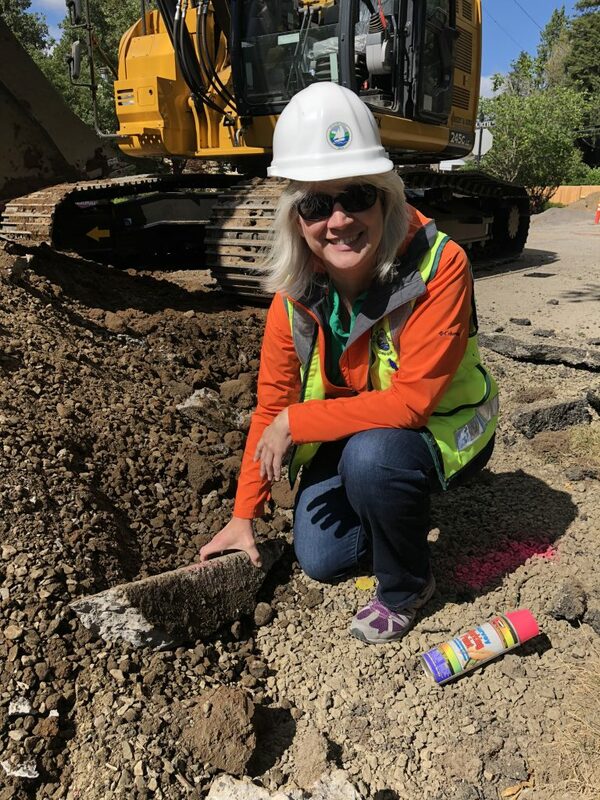 The purpose of the shutoff is to connect a new valve to an existing waterline at the intersection of D Avenue and 1st Street as part of the project. To minimize impacts and inconveniences to both residents and businesses affected by the shutoff, this work will be conducted at night from 11 p.m. – 6 a.m. Crews will conduct as much preparatory work during normal work hours, but night work will result in noise from excavation equipment, truck traffic, movement of steel plates, running a hot saw, a generator and miscellaneous equipment. This work is expected to take one night to complete. 48-hours prior to the shutoff, residents and businesses that are affected will receive a door hanger notifying you of the shutoff event. On a disappointing note, the temporary construction trailer located at the 10th Street/C Avenue reservoir site was recently vandalized with dog excrement. In addition, dog owners or keepers have been littering – several bags of dog excrement have been left throughout the reservoir site on multiple occasions. City Code requires that all dog owners or keepers of dogs promptly remove all excrement or other solid waste deposited by their dog in public spaces. The City has begun monitoring the site more intensely due to recent vandalism activity. We are also asking neighbors to please keep an eye out and report any suspicious activity to the Lake Oswego Police Department, 503-635-0238. Construction is disruptive, impactful and an inconvenience. Crews are trying to conduct the work as efficiently as possible. 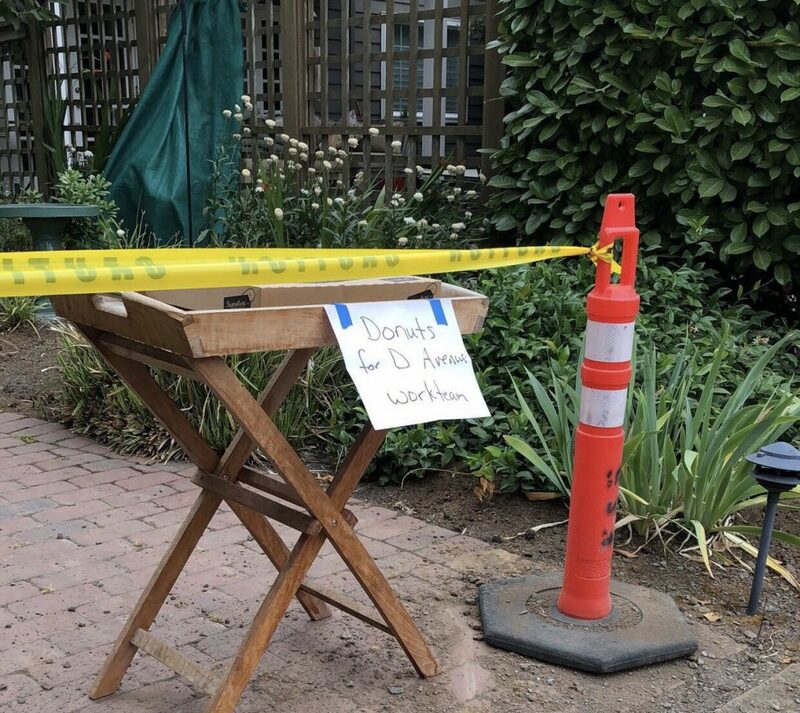 For safety reasons, please do not attempt to interrupt their work, nor approach them or their vehicles and equipment within the work zone areas. It is not safe and it is distracting to the workers, ultimately affecting their efficiency. If you have concerns or questions about the project, please contact the project team directly and we will address your concerns promptly. This way we keep the area safe, not only for the workers but also for residents and pedestrians. Thank you for abiding by our continued request to not enter the work zone or disrupt the workers. 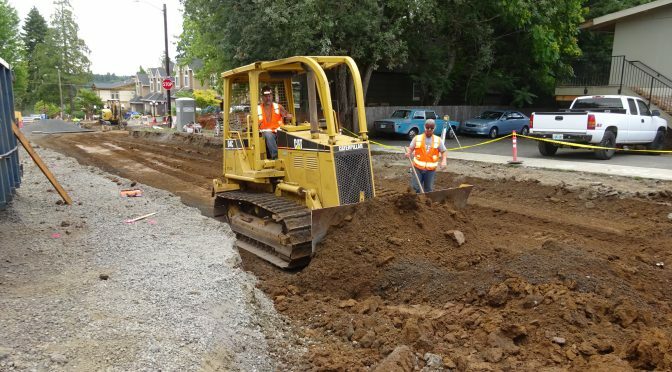 With minor work taking place this week, and some outstanding storm inlets and other miscellaneous work remaining, crews are now expecting to start the road excavation work the week of July 16. This will result in full (24/7) road closures in multiple block segments along D Avenue for up to eight weeks. The first segment to close will be from 1st Street to 4th Street. The second segment will be from 4th to 7th, the third from 7th to 10th and final segment from State to 1st. We understand how inconvenient and disruptive construction is and we thank you for your patience while we make these important improvements.